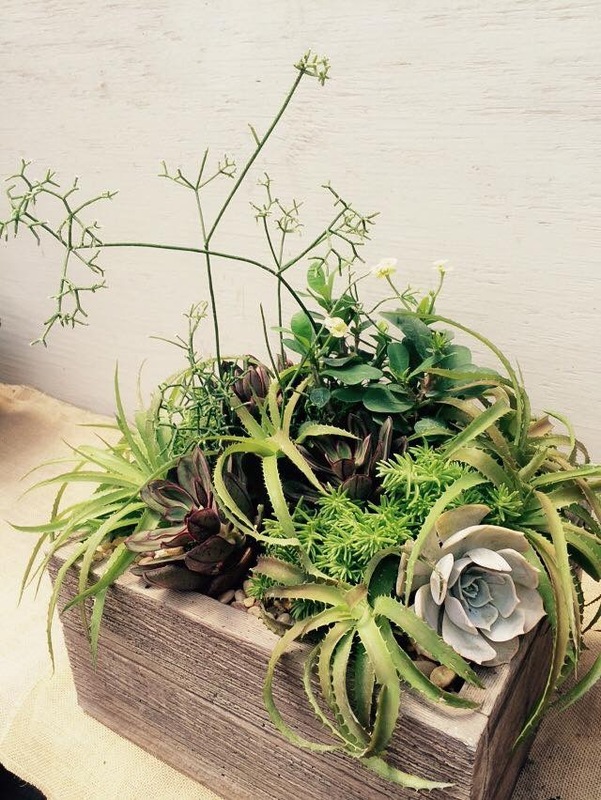 Succulent Plantings…When Summer Heat Sizzles! While parts of the country are enjoying an unusually cool summer, here in the heart of the south the temperature and humidity can still soar. Unfortunately, even nighttime temperatures rarely provide respite from the unending heat, though, thankfully, we (and our plants!) have had a couple of welcome breaks this year. While there are plenty of tough, heat tolerant plants that, with the proper maintenance, work very well in our landscapes, this post is going to concentrate on succulents, with examples of some recent container plantings. 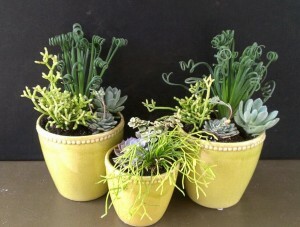 Look HERE for more succulent arrangements we’ve done in the past too. Three bright yellow pots provide a temporary home as a centerpiece trio, then these plants will move outside for the rest of the season. The curly little number here is an interesting, and new to the plant scene (at least for us), succulent-like plant (It’s actually a bulb.) called Albuca spiralis ‘Frizzle Sizzle’. Native to South Africa, its growth actually slows during the heat of summer, and it must be kept on the dry side during this resting period. As we move into the colder winter months, it will begin to grow again and should make a relatively easy indoor plant for a bright room inside. 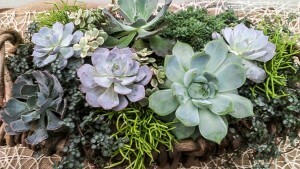 The basket planting shows a tiny leaf blue-green succulent-like plant that is actually a Pilea called ‘Aquamarine’. It has fast become a favorite for succulent and other arrangements in containers. The tiny leaves grow quite quickly, mingling with other plants and eventually trailing, seemingly indefinitely! This mixture also has echevarias, workhorse succulents that can grow to enormous proportions. The square brown planter is home to a variety of succulents, including a number of Hechtia glomerata. It’s in the Bromeliad family and native from Texas down into Central America. Species of Hechtia are terrestrial and inhabit dry, rocky places and often seen growing on vertical walls along rivers, where the soil drains exceptionally well. Hechtia is a plant that’s new to us this year. We’ve noticed it has the spiny edges on leaves that some bromeliads are known for. 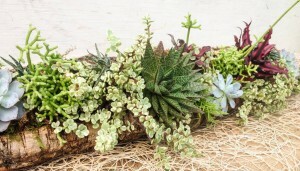 Succulent plants and air plants, Tillandsia, are perfect partners, as you can see in this cork bark composition. Here’s the Hechtia again, with another plant called Rhypsalis. Rhypsalis is another fascinating plant. It’s actually in the cactus family and most are native to Brazil. Its name is derived from the Greek word rhips, which means wickerwork and refers to the slender, flexible, reed-like stems. Rhipsalis are primarily epiphytic, meaning they live in trees, but some also grow in the cracks of rocks. Quite a versatile little cactus! It doesn’t have spines like a conventional cactus; instead the stems seem almost flattened and branch frequently. Flowers are among the smallest of cactus flowers and usually white, though some may be tinged with yellow or red. 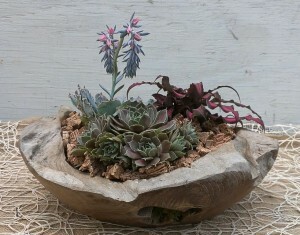 The wooden bowl shows an old favorite, sempervivum or hen and chicks, a well known succulent and widely available in many rosette colors. One thing we’ve learned about “semps” is they really do appreciate a bit of shade in the afternoon here in Birmingham. Maybe it’s our constant humidity. At any rate, a touch of shade seems to help. 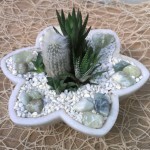 Another cactus called ‘Old Man’ and a little succulent called Haworthia are at home in a small marble container. There are no drainage holes in this piece, so careful watering must be done sparingly. Finally, a long, very narrow piece of cork bark is home to a varied selection of succulents including Portulacaria afra, sometimes called miniature variegated jade plant though it’s a different species. 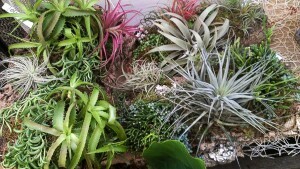 Its small, cream-variegated leaves on reddish stems are striking combined with the echevarias, haworthias, Cryptanthus, and Senecio rowleyanus or string of pearls (not shown in this picture). With bright light and a light hand with water, this planting should flourish. These plantings are just the tip of an amazing succulent iceberg. We’re constantly on the lookout for others to expand our design repertoire. So far we’re having a grand time! 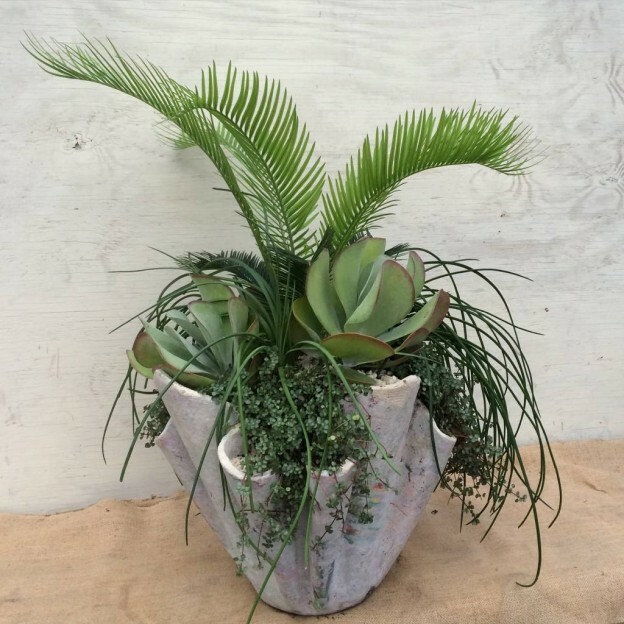 This entry was posted in Arrangements, Container, Indoor landscape, Planting Tips, Succulents, Summer and tagged albuca spiralis, bromeliads, cactus, container gardening, cryptanthus, designing with succulents, haworthia, hechtia glomerata, hen and chicks, miniature variegated Jade plant, portulacaria afra, rrhypsalis, sempervivum, senecio rowleyana, string of pearls, succulent arrangements, succulent combinations, succulent plantings, succulents, succulents in containers on August 5, 2014 by Kris Blevons.